Welcome to the Fortnite Season 7 Week 9 Challenges: Battle Star Treasure Map & Dancing, Balloons Locations Guide. Here you will find out how to get to the Dancing, Balloons & Treasure Chests Locations in Fortnite Battle Royale on PS4, Xbox One, PC, Mac, Switch & Mobile. 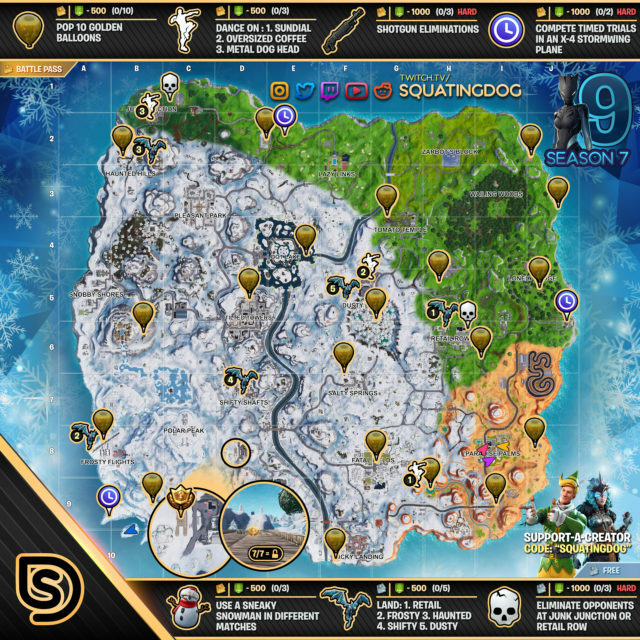 How To Find Search Challenge Locations In Fortnite Battle Royale – Season 7 Week 9: This guide will show you Season 7 Week 9 of Fortnite’s Battlepass Challenges that includes finding all of the Chests as well as the Dancing, Balloons locations around the map. Note: The Weekly Challenges will be available on January 31th at 4am ET/8am GMT. Tips: By completing the 9 weekly challenge sheets, you are rewarded with a loading screen that has a secret banner hint. This loading screen leads you to the wooden Slay next to Polar Peaks. 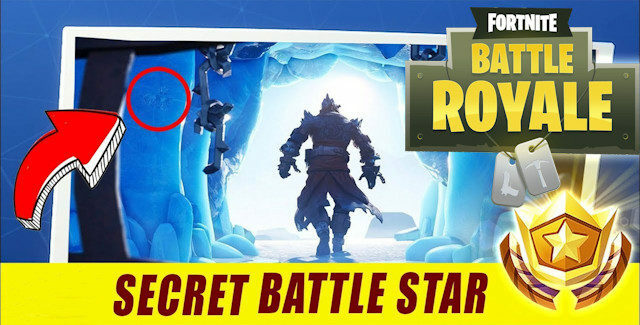 Tips: The Sneaky Snowman can be found as floor loot and in chests. Simply use R2/RT to throw them or L2/LT to become one. Tips: There are a total of 10 Golden Balloons that you need to pop for the “Pop Golden Balloons” challenge in season 7 week 9. There are more than 10 Golden Balloons around the map, but you only need 10 of them to complete the challenge. This video shows the easiest ones to get in the most direct route. When you successfully find and pop a Golden Balloons, it will come up on the screen saying you have done so. This video includes one of the fastest routes to get all 10 Golden Balloons, so you could even do it in one game. Note: You’ll need to win/lose the game for the Golden Balloons you’ve popped to count towards the challenge. You cannot just quit. #10. 3:09 – Haunted Hills (west side on top of building)? Tips: When you successfully dance on top of one of the oversized areas, it will come up on the screen saying you have done so. As this is a staged challenge, you need to do it in 3 different games. So, you’d do the “Dance on top of a Sundial” challenge in your first game, then in your next one you can do the “Dance on top of an Oversized Cup of Coffee” one and so on. Note: You’ll need to win/lose the game for it to count towards the challenge. You cannot just quit out the game. Tips: There are only two timed trials for the Stormwing on the map, you need to do both of them for the challenges. — When you successfully complete a stormwing time trial, it will come up on the screen saying you have done so. The best thing to do is get an X-4 Stormwing from Frosty Flights (loads spawn here) and then bring that plane to both time trials shown in this video guide. Note: You’ll need to win/lose the game for it to count towards the stormwing time trial challenge. If you quit out it will not count. Time to complete Fortnite Battle Royale’s Battle Pass Challenges for Season 7 Week 9!